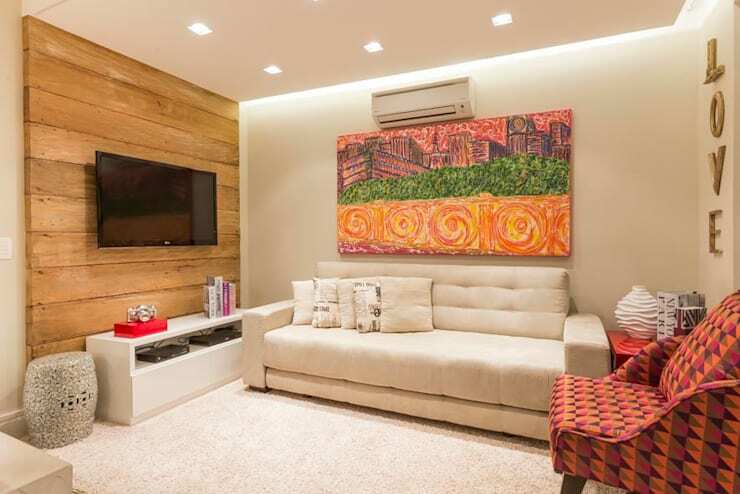 A good family home should offer something for everyone, especially when we're talking about small spaces that need smart solutions to be exploited in the design of a home befitting you and your family. We all need a house that does not make us feel like there is a shortness of space. The high prices of apartments are skyrocketing, leaving us with less options for smaller spaces. We are bound to end up living in tiny homes, but this need not mean we can have the home of our dreams. Today we will take you on a tour inside an apartment of a mere 57 m², but with a stunning design which assure everyone that space is not everything! Even with such a small space, some finishing touches and making sure not to overstock furniture ensured the outcome of this amazing masterpiece of a home that leaves nothing wanting for a larger area. Let's take a look! Here we have a beautiful room that is tasteful, wonderful and unique with vibrant colors chosen by the designer to add a remarkable character to the room with the complement of bright lighting that increases the amount of space, in our opinion. The room is widened to suspend a television and a small closet underneath it for all purposes. The elegance of this ensemble is augmented by the use of wood. Just look at the tasteful additions the designers made in terms of the furniture and art. Do you think this room now lacks anything? We certainly don't think so! Creativity in the details is what makes this room so special, and provides exceptional character in the entire design. 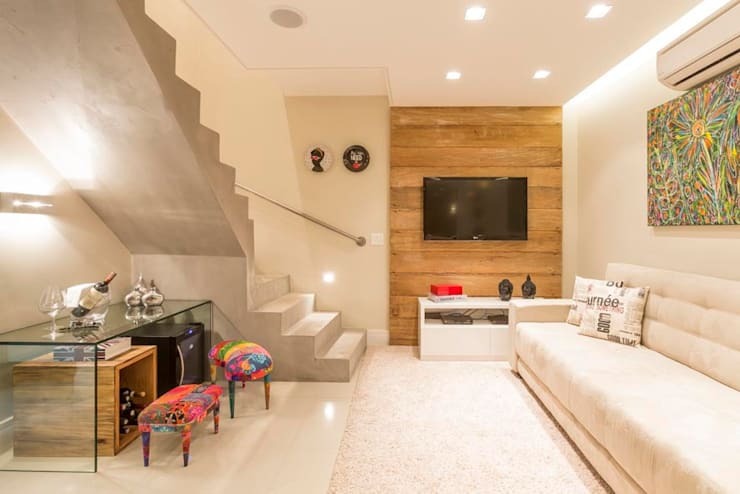 The use of concrete in the design shows the great exploitation of space, which gave an opportunity to create an area to rest under the stairs where two seats and a small bar for drinks can be seen. On the upper floor we know there is a kitchen, which will allow quick access to a snack or drink. The seats are in line with the wonderful painting and chair in the living room and it all really works with the creative use of colours. Despite the small size of the kitchen it seems neat and tidy, and limited space does not mean you can't get a practical kitchen sufficient for all your needs and modern at the same time. the designer used a white color which gives a broader space with high lighting as well. Placing the sink in front of the window is always a favourite choice, as it provides an entertaining look through it while washing the dishes, making that long and boring task more bearable, especially if the dishes have accumulated! Here we have the family bathroom of the apartment. From this perspective we can see the sink area, and some of the decorative details of the room. The most notable element of this ensemble, is the use of the colour scheme. The wall is in a smoky beige, creating a very natural and textured backdrop. In contrast to this, we can see the stark white basin, which provides some visual interest and an elegant touch. The entire composition is cool, calming and neutral—preferable qualities for a serene bathroom. Lastly, we have this entertainment area of the home. This lovely space is situated below skylights, which allow natural light to fill the entire room, livening the atmosphere and warming the space. In addition this, a neutral beige was used on the walls to reflect the light. At the back of the image we can see an indoor grill and accompanying food preparation space—perfect for a brain, whatever the weather. What more could you want in a compact apartment?! We certainly think this small home was very impressive, and indeed, it is often the most: Simple homes that hold the most secrets! Let us know what you think of this home in the comments!